Sound Systems that Would Please any Church Sound Guy! Throughout the life of a church and its worship ministries, many material needs arise ranging from church furnishings such as pulpits, church pews and kneelers to steeples and portable sound systems. Churches can range in size from a dozen up to tens of thousands in the "mega-churches." Since each has a message that needs to be heard, Amplivox has different sound systems for every occasion and group size. With the different types of services and functions churches offer, live sound equipment such as PA systems and church audio systems are important to communicate your message and provide a crystal clear musical experience. Some other live sound equipment that Amplivox offers are microphones (amp microphones, pa microphones, or mixer microphones), mixer equipment, amplifiers, audio cables, power sources, as well as other sound equipment like public address systems, and megaphones for outdoor events. Sound lecterns are great for those who want to combine stylish presentation with a dynamic sound that would please any church audio guy. We have wireless sound lecterns and many adjustable height sound lecterns that could be the perfect fit for your situation. Our sound tabletop lecterns are a great functional addition also. Questions about any of our products? Give us a call toll-free at (800)267-5486 or email us, or click on the "Live Chat" link on our homepage! 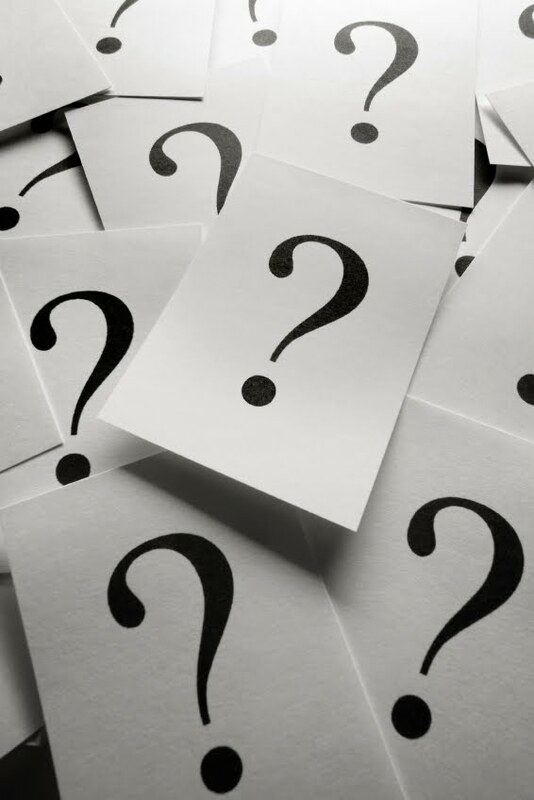 Our Frequently Answered Question Page answers many of the questions you have about Amplivox's products or sound systems in general. What is a Dual Module Speaker? Model S1201 is a Dual Module Speaker. It has 2 speakers built into a durable acoustically carpeted cabinet with built-in handle & tripod mount. When I turn my amplifier on, nothing happens. First, check your power source: If you are powering the system with 10 D-cell alkaline batteries, check each battery to see that it is producing 1.5 volts (15 volts total). If you are using the external AC Adapter/recharger (AmpliVox Model S1460), connect it to the jack marked "DC In". The output will be 15 volts, 2 amps, with center positive.If you are using our rechargeable system, turn the amp power switch to the "OFF" position, connect the S1465 NiCad Battery Pack to the matching connector inside the amp, and plug in the S1460 AC Adapter/recharger. Leave the amp power switch off until you complete the charging process (8-12 hours or overnight). How do I avoid squealing or feedback? Where should I be in relation to the "speaker" in the unit? Feedback occurs when your microphone is too close to the speakers. To avoid feedback in any sound system the presenter should stand to either side of or behind the speakers. When standing in front, the presenter should leave at least 10 feet between herself and the speakers. You can also turn down the microphone volume. Can I add more microphones to my AmpliVox sound system? Yes. You can add wireless mics as well as wired mics. The amplifier has 3 mic inputs. You can purchase an external mixer, which will increase the number of mic inputs. 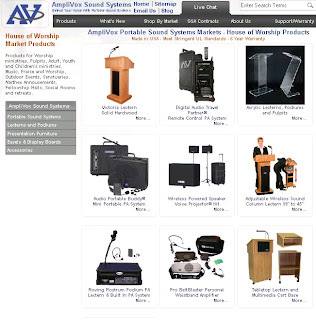 Amplivox's products fit a wide variety of events with some suggested events being trade shows, seminars, workshops, religious events, sporting events, cruise ships, career fairs, conventions, concerts, exhibitions, track meets, charity events, fund raising events, walk-a-thons, meetings, banquets, festivals, parades, and our markets which include government, education, sports, corporate, hospitality/entertainment, worship, healthcare, law enforcement/fire department. Was your question not answered? Give us a call toll-free at (800)267-5486 or email us and we will get back to you ASAP! 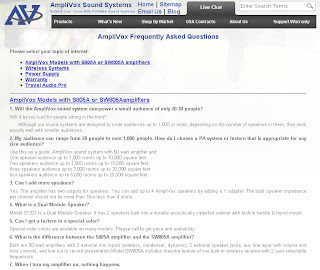 To see the entire FAQ page, click on Frequently Answered Questions for Amplivox Sound Systems. Wide Area Portable PA Systems -- Our Wide Area Wireless Outdoor Sound Systems cover up to 5,000 people and a size of up to 50,000 Sq. Ft in our Half-Mile Hailer Loudspeaker PA System. Check out customer review videos of the Half-Mile Hailer on our video page! Another gem is our line of megaphones that has bipartisan support, having been used by Barack Obama and the Tea Party. School Listening Centers -- Our line of school listening centers come with a cassette tape player, a cassette deck, CD player, built in microphones, cassette recording possibilities and more. Whether you're in the market for an outdoor sound system, sound system speakers, mp3 audio system, iPod Pa System/Sound Speaker System, a Sound System Package, a sound system with audio visual integration, a pro PA system, pa system microphone mixer, church sound system, or anything else, we have what you need! Click this link to learn how to select a potable PA system that fits your needs. Already have a sound system and just need to complete it? Many sound system accessories are available also. Another option is to build your own sound system by mixing and matching speakers, tripods, microphones, cables, and cases to fit your exact needs. 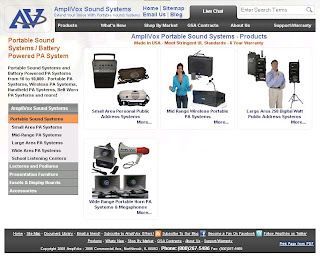 Never miss any of our PA system or sound system sales or our informative Youtube videos! Stay informed by signing up for our Newsletter that includes sound system sales and news! 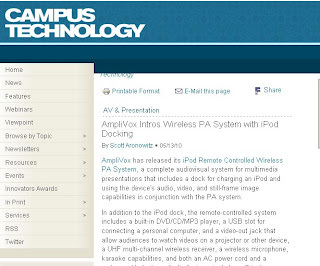 Recently Amplivox's iPod Wireless PA System was featured on several websites including Campus Technology, The Utah Mentor Network, Lighting and Sound America Online and eCampusNews (look on the third page). Click on the links to read the articles or click here to read about our SW720 iPod PA System! 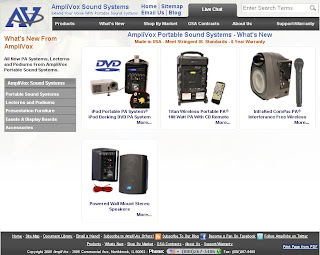 Amplivox is your one stop shop for all of your sound system needs. Pro quality or personal use, no matter what your needs are, Amplivox has a solution to fit them and your price range. Small Area Portable Sound Systems -- These basic PA sound systems include the BeltBlaster Pro Personal Sound Tour Guide System and the Mityvox Wireless Battery Powered PA System that are great for small areas like tours and indoor use. Mid-Range PA Sound Systems -- For audiences up to 3,000 and a room size as big as 20,000 square feet, our Mid-Range compact PA Systems are the perfect option for you. Our InfraRed Compac PA System with Remote Control incorporates an infrared signal to function wirelessly and is perfect for a classroom or conference room setting. Our Voice Carrier Presentation Stereo Sound System is a powerful wireless microphone speaker system that is great for indoor and outdoor use due to its portability and ease of use. Don't forget our signature world-class amplifier, the Wireless Stereo Sound System Amplifier perfect for business or personal use at home. Large Area Sound Systems -- These systems can reach up to 7,500 people and an area of 25,000 square feet. The Wireless iPod Portable Speaker Sound System is a cutting edge, critically acclaimed mp3 audio system that offers audio visual system integration with a DVD player and connection for a projector. The Digital Audio Travel Partner PA System is a lightweight all in one system that is powerful, portable, and expandable for outdoor/indoor use. There are many bundles available. To finish the article, please continue to Part Two. 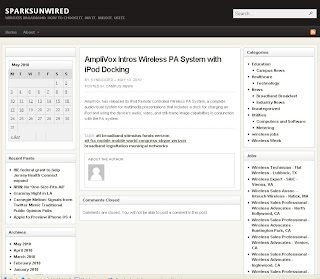 In the past, we have mainly done this blog to show some of our products and what products Amplivox has to offer. We are hoping to change gears a little and throw other blog entries into the mix, but need your feedback on what topics to include. What do you think? What would you read? Please suggest whatever you want, whether it be something about Amplivox or anything at all. We would also like feedback about our Youtube videos and suggestions for new videos to make. Titan Wireless Portable PA -- This portable PA system had a CD drive and remote control! InfraRed ComPac PA System -- This is perfect for classrooms and conference rooms, comes with wireless mic and mounting bracket (watch video). Wired Powered Speakers -- Reach audiences up to 500 in a 1,000 sq. ft. room with this versatile product! Ideal for classroom settings. Coming soon, the Mity-Lite Portable PA System (SW300)! This PA system is designed to be worn over the shoulder like a purse for easy portability and comes with a wireless handheld mic. Don't forget about all of our other portable sound systems and lecterns! The internet is changing how we are entertained, how we communicate, how we do business, and how we live life. Without the internet, I wouldn't have a job! I love lists on the internet letting me know about awesome sites, so I thought I would make one myself. We have all been to Youtube and Facebook, now here are some lesser known sites that are awesome. Warning: going to these sites could change your life. Yelp -- Yelp has user reviews of local stores and restaurants that give a customer's opinions about the experience. You can search by location, name, type of establishment, or any combination of the above. Great for finding new places to try in your area. CourchSurfing-- If you have been bit by the travel bug, or have a job where you travel a lot, this site is for you. This site is perfect for travelers looking to find a couch to crash on and make connections in the place they are visiting. Think about it, instead of going to a new city, paying to stay in a hotel and not knowing anybody, you can have a place to stay for free and someone to show you around. The ratings and references system keeps people informed and safe as can be. I wish I had known about this sooner! eHow -- eHow and its sisters, HowStuffWorks and WikiHow, all capitalize on the fact that people turn to the internet to fill in the blank for "How do you do __________?" From the normal "How to Make a Fruit Smoothie" to "How to Get Rid of a Sunburn Fast", these sites help you know how to do something. GasBuddy -- With summer just around the corner, it is inevitable that gas prices rise along with the temperatures. One way to spend less on gas is by using GasBuddy, the site that tells you where the cheapest gas is in your area. RetailMeNot -- When buying an item online, do you wish you had a coupon code to put in the blank on the checkout page? RetailMeNot is a community that lists different coupon codes that actually work! Every time you buy something online you should check out this site to save some money. I normally save around $15 when I use this. What are some sites you can't live without? Leave a comment! Comedian Jerry Seinfeld once commented about how the fear of public speaking is more prevalent than the fear of death, "To the average person, if you go to a funeral, you're better off in the casket than doing the eulogy." The truth is that amidst fears, communicating publicly is a vital part of business and education. There are many factors that can make or break a large presentation: size and shape of room, lighting, acoustics, visual aids, furniture (lecterns and podiums, tables, chairs), and combinations of the above factors. But how do you optimize the experience of the listener? Amplivox has created a document called the Space Planning Guide to assist in doing just that. 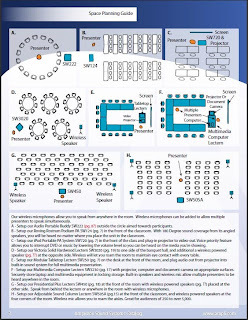 In this document we show how to optimize the use of our Audio Portable Buddy (SW222), Roving Rostrum Podium PA (SW124), iPod Portable PA System (SW720), Victoria Solid Hardwood Lectern (SW3020), Modular Tabletop Lectern (SW250), Multimedia Computer Lectern (SW3230), Presidential Lectern (SW450), and our Adjustable Sound Column Lectern (SW505A). If you want to create the perfect environment for a presentation and even get tips on room decor, check out our presentation tips blog post and our Pocket Training Tips Guide. Click on the link to see the Space Planning Guide. These tips can apply to so many different types of events. Just to name a few: seminars, trade shows, state fairs, open houses, wine tastings, book signings, art exhibits, new product demonstrations, workshops, conferences, seminars, lectures, sales meetings, educational classes, business presentations, religious events (worship services, church retreats and outings), camps, fundraisers, charitable events, sports competitions, marathons, charity events, chamber of commerce, group activities, mixers, reunions, club meetings, holiday parties, birthdays, client appreciation events, recreation events, receptions, buffets, banquets, neighborhood block parties, and board meetings. Amplivox has you covered with everything you need for your presentation with: sound systems, lecterns, presentation furniture, microphones, speakers, accessories, and more! 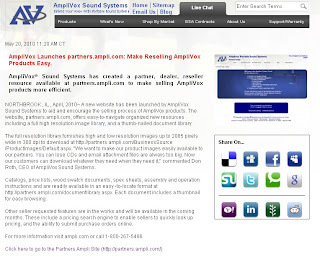 May 5, 2010--Lincolnshire, IL --Cinco de Mayo was a special day for both those of Mexican heritage and those at Amplivox. 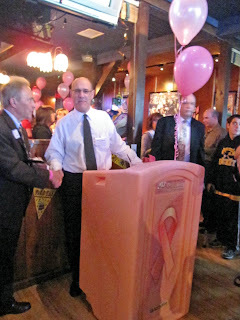 On May 5th one of Amplivox's Pink Promise Podiums was featured in an event sponsored by Alan Orlowski, Attorney at Law, to raise money to combat breast cancer. This event held at the Cubby Bear restaurant in Lincolnshire had approximately 150 attendees who paid $10 at the door that was donated to Avon Walk. It was a great event and a great time! The Pink Podium has created quite the buzz in the media with articles in the Market Wire, News Blaze, Lincolnshire Review, the Examiner, GNT, TribLocal, and on our website. There have even been blogs about our pink podiums! 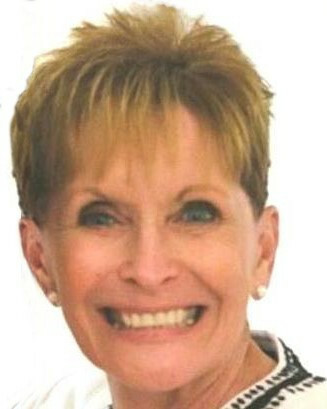 The Pink Podium got a shout out in the Northbrook Chamber of Commerce's Newsletter, click here to see it for yourself. We also were written about in an article about the Pink Ghost Foundation which focuses on minority women battling breast cancer.